The ultimate sleeping experience from day one onwards: the multi-functional cot that grows with your baby. This bedding set to complement the growing, multi-functional cot is made from 100% pure cotton (Standard 100 by OEKO-TEX®), while this 12-piece bedding set is supplied with a screw-clamp canopy bar. 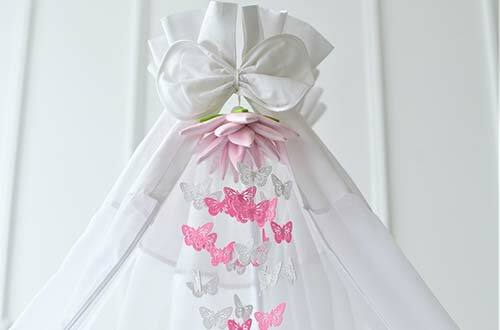 A textile covering, complete with bow, protects your child from draughts and direct sunshine. This bedding set is ideally suited for the SmartGrow 7-in-1 cot/toddler bed, as well as other commonly available cots. Two cushions, two blankets and the associated covers also form part of this complete bedding set, designed for your child’s comfort.